Here’s the not-so-sweet truth. We are killings ourselves by consuming truckloads of hidden sugar. Despite 40 years of Americans being brainwashed into thinking that fat is bad, it turns out it’s sugar, not fat, that makes you sick and overweight. The facts are in, the science is beyond question. Sugar in all its forms is the root cause of our obesity epidemic and most of the chronic disease sucking the life out of our citizens and our economy — and, increasingly, the rest of the world. You name it, it’s caused by sugar: heart disease, cancer, dementia, type 2 diabetes, depression, and even acne, infertility and impotence. The average American consumes about 152 pounds of sugar a year. That’s roughly 22 teaspoons every day for every person in America. And our kids consume about 34 teaspoons every day — that’s more than two 20-ounce sodas — making nearly one in four teenagers pre-diabetic or diabetic. Flour is even worse than sugar. We consume about 146 pounds of flour a year. Think about it. That’s about one pound of sugar and flour combined every day for every man, woman and child in America. And flour raises blood sugar even more than table sugar. Even whole-wheat flour. 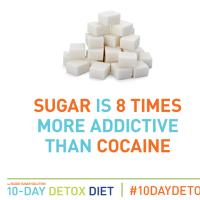 Here’s another shocking fact: Sugar is eight times as addictive as cocaine. Being addicted to sugar and flour is not an emotional eating disorder. It’s a biological disorder, driven by hormones and neurotransmitters that fuel sugar and carb cravings — leading to uncontrolled overeating. This is not a limited phenomenon. It’s the reason nearly 70 percent of Americans and 40 percent of kids are overweight. In one study, Harvard scientists found that a high-sugar milkshake (compared to a low-sugar one) not only spiked blood sugar and insulin and led to sugar cravings, but it caused huge changes in the brain. The sugar lit up the addiction center in the brain like the sky on the Fourth of July. Think cocaine cookies, morphine muffins or smack sodas! We need a clear path to detox from sugar, to break the addictive cycle of carb and sugar cravings that robs us of our health. And it only takes 10 days — or less. We need science, not willpower, to reverse this. That’s why I created The Blood Sugar Solution 10-Day Detox Diet. Early last year, I invited more than 600 people to try it out, and they lost more than 4,000 pounds in 10 days. But more important, they did it painlessly by enjoying powerful addiction-reversing foods that rewired and reset their brains and bodies. No cravings, no bland or boring diet food, no deprivation. Just abundance and delight. And at the end of the 10 days, they got their bodies and their minds back, and learned a new way to eat and live that will last a lifetime — a long one! More recently, another group of 30 people tried my plan, and had very similar results. You can read about their experiences and results . You’ll see for yourself how well it worked. In my book, The Blood Sugar Solution 10-Day Detox Diet, you’ll learn how to make these top 10 big ideas for detoxing from sugar and refined carbs work for you in just 10 days. In my book, there are three simple quizzes to help you know you need to detox. If you answer “yes” to any of these questions, a sugar detox is your ticket to feeling great quickly and losing weight painlessly. The first is the diabesity quiz. Do you have pre-diabetes or type 2 diabetes? (90 percent of Americans have not been diagnosed.) Do you have belly fat? Are you overweight? Crave sugar and carbs? Have trouble losing weight on low-fat diets? Have high triglycerides, low HDL (“good”) cholesterol or been told your blood sugar is “a little high”? The second is a food addiction quiz. Do you eat when you’re not hungry? Experience a food coma after eating? Feel bad about your eating habits or avoid certain activities because of your eating? Get withdrawal symptoms if you cut down or stop eating sugar or flour? Need more and more of same bad foods just to feel good? The third is the FLC Quiz (or the Toxicity Quiz). FLC stands for Feel Like Crap. FLC Syndrome has a list of symptoms including bloating, gas, reflux, irritable bowel, joint or muscle pain, brain fog, memory or mood problems, sinus or allergy symptoms and more. Millions of us have FLC Syndrome and don’t know we are only a few days away from health and happiness. There is no way to handle a true physiological addiction except to stop it completely. Addicts can’t have just one line of cocaine or just one drink. Go cold turkey. But you won’t have to white-knuckle it because if you follow these 10 Big Ideas you will automatically reset your body’s neurotransmitters and hormones. Stop all forms of sugar, all flour products and all artificial sweeteners — which cause increased cravings and slow metabolism, and lead to fat storage. Also get rid of anything with trans or hydrogenated fats and MSG (watch for hidden names). Ideally, for 10 days you avoid any foods that come in box, package or a can or that have a label, and stick to real, whole, fresh food. And the best way to really detox is to give up ALL grains for 10 days, too. Any form of liquid sugar calories is worse than solid food with sugar or flour. Think of it as mainlining sugar directly to your liver. It turns off a fat storage machine in your liver, leading to dreaded belly fat. You don’t feel full, so you eat more all day and you crave more sugar and carbs. It’s also the single biggest source of sugar calories in our diet. That includes sodas, juices other than green vegetable juice, sports drinks, sweetened teas or coffees. One 20-ounce soda has 15 teaspoons of sugar; Gatorade contains 14 teaspoons of the stuff in one bottle. One can of soda a day increases a kid’s chance of being obese by 60 percent and a woman’s chance of type 2 diabetes by 80 percent. Stay away! Protein, protein, protein at every meal — especially breakfast — is the key to balancing blood sugar and insulin and cutting cravings. Start the day with whole farm eggs or a protein shake. I recommend my Whole Food Protein Shake. Use nuts, seeds, eggs, fish, chicken or grass-fed meat for protein at every meal. A serving size is 4-6 ounces or the size of your palm. Yes, that’s right. Unlimited carbs. Did you know that vegetables are carbs? And you get to eat as much as you want. Unlimited refills! There is one catch. I only mean the non-starchy veggies such as greens, the broccoli family (cauliflower, kale, collards, etc. ), asparagus, green beans, mushrooms, onions, zucchini, tomatoes, fennel, eggplant, artichokes, peppers, etc. What’s out are potatoes, sweet potatoes, winter squash and beets — just for 10 days. Also skip grains and beans for 10 days. It supercharges the results so you lose weight and feel great. Fat is not a four-letter word. Fat doesn’t make you fat, sugar does. Fat makes you full, balances your blood sugar and is necessary for fueling your cells. Along with protein, have good fats at every meal and snack including nuts and seeds (which also contain protein), extra virgin olive oil, coconut butter, avocados, and omega 3 fats from fish. You never want to be in a food emergency when your blood sugar is dropping and you find yourself in a food desert such as an airport, the office, or in a maze of convenience stores, fast food joints and vending machines. You need an Emergency Life Pak. I have one with me all the time, filled with protein, good fats, and good snacks so I never have to make a bad choice. Here’s what’s in mine. Packets of Artisana nut butters and coconut butter, almonds, walnuts, pumpkin seeds, salmon jerky or turkey jerky, a can of wild salmon or sardines and unsweetened wild blueberries. If you are stressed, your hormones go crazy. Cortisol goes up which makes you hungry, causes belly fat storage and leads to type 2 diabetes. Studies show that taking deep breaths activates a special nerve, called the vagus nerve, that shifts your metabolism from fat storage to fat burning and quickly moves you out of the stress state. And all you have to do is take a deep breath. My Take Five Breathing Break is something you can do anywhere, anytime. Simply take five slow deep breaths – in to the count of five, out to the count of five. Five times. That’s it. Do this before every meal. Watch what happens! Studies show that inflammation triggers blood sugar imbalances, insulin resistance, pre-diabetes and type 2 diabetes. The most common source of inflammatory foods other than sugar, flour and trans fats are hidden food sensitivities. The most common culprits are gluten and dairy. We often crave the foods we’re allergic to. Without them we feel lousy and want more. Quit gluten and dairy for ten days. Getting off them isn’t easy, but after just two to three days without them you’ll have renewed energy, relief from cravings, and will see many of your common symptoms disappear. Getting less sleep drives sugar and carb cravings by affecting your appetite hormones. In human studies, depriving college students of just two hours of the recommended eight hours of sleep led to a rise in hunger hormones, a decrease in appetite-suppressing hormones and big cravings for sugar and refined carbs. You want more energy if you don’t sleep, so you go toward quickly absorbed sugars. Sleep is the best way to fight against the drive to overeat. You literally can sleep your cravings and your weight away. All of these ideas and a goof-proof, step-by-step plan of how to make them work for you are in my new book. “If all Americans could to this! Our country would be happier, friendlier most importantly, healthier and gosh darn it…we could have world peace! Amen Dr. Mark Hyman! It’s a process that needs constant attention. Once your body reaps the rewards & you know you’re worth it- it makes TOTAL SENSE. Thank you!” ~ Marie N.
“I’ve never made a commitment to my health as I have with this detox. My doctor was skeptical and wanted to put me on insulin. I wanted to prove her wrong and was committed to go through the program to take my health back. It helped me realize how compulsive I’ve been with food. How I would reward my stressfull events with sweet treats. My husband joined me on the detox and he is also thrilled with the results. Thank you Dr. Hyman and staff for this amazing program.” ~ Jean Y.